"We must agree a deal that this House can support and that is what I am working to achieve," she told the House of Commons in an update on Brexit negotiations. "The talks are at a crucial stage," May added. "We now all need to hold our nerve to get the changes this House requires and deliver Brexit on time." But the opposition was having none of this. "Our country is facing the biggest crisis in a generation, and yet the prime minister continues to recklessly run down the clock," said Labour Party leader Jeremy Corbyn. Pro-Brexit British lawmakers fear it could trap the U.K. in regulatory lockstep with the EU, unable to strike new trade deals around the world. May and other Cabinet ministers are holding talks with senior EU officials in an attempt to add a time limit or an exit clause to the backstop. But EU leaders insist the legally binding withdrawal agreement can't be changed. Chief EU Brexit negotiator Michel Barnier said Monday that "something has to give" on the British side to secure an orderly Brexit. 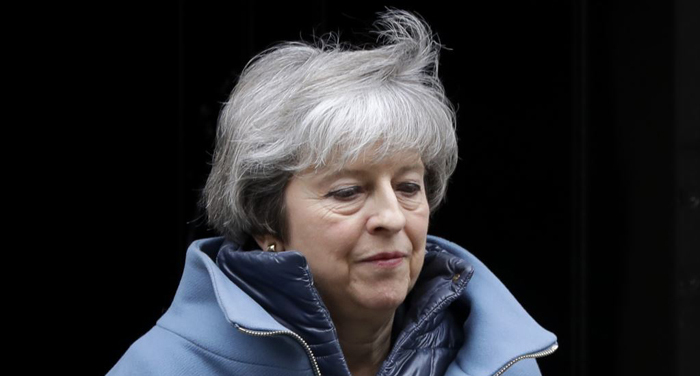 May's political opponents accuse the government of deliberately wasting time until lawmakers face a last-minute choice between her deal and no deal. Corbyn said May "is playing for time and playing with people's jobs, our economic security and the future of our industry." House of Commons leader Andrea Leadsom, who is in charge of the parliamentary timetable, denied the government was wasting time. She said May would bring her deal back to Parliament for a vote "as soon as the issue around the backstop has been sorted out." "It is a negotiation. It's not possible to predict the future," she told the BBC. Uncertainty about what trade relationship Britain will have with the bloc after Brexit is weighing on the U.K. economy. Figures released Monday showed Britain's economy slowed last year to its joint-slowest annual rate since 2009, with business investment declining for four straight quarters.